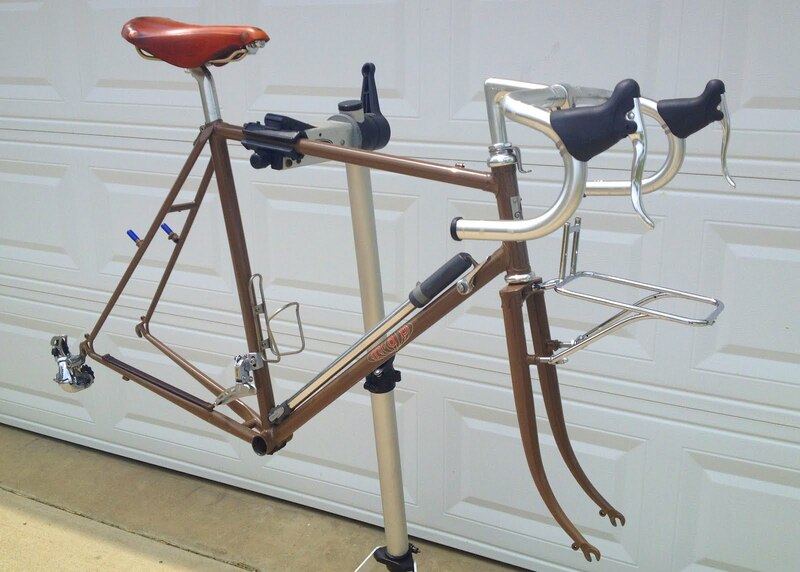 There hasn’t been much progress on the rando bike project. At least not much you can see. I did close the deal on the A. Homer Hilsen frameset, and shipped it out this morning. The country bike from rural northwest Denton County, Texas is on his way to Brooklyn, New York. I reckon that’ll be quite a change. I also made some refinements to my Berthoud handlebar bag so it will work better with Mitch’s custom rack. But I need a drivetrain. Due to a variety of reasons, some important parts haven’t yet arrived. I’m waiting on a rear wheel, bottom bracket, and new 8-spd cassette. Oh yeah, and brakes from a bike my brother is borrowing. Hopefully, everything I need will be here next week. In the meantime, I’ve been trying to strike what might be called a build balance. While waiting for parts, I want to get as much done as I can (to save time later), without having to disassemble something because I went out of sequence or I have stuff in the way. Normally, the water bottle cage is about the last thing I attach, but there it is (probably in the way). I did a little more tinkering after the photo was taken. Since downtube shifters and both derailleurs are on, I added shift cables. Then I explored a couple of options for adding a little padding under my cloth outer layer bar tape (no, not yet wrapped). Finally, I polished off the “Shimano 105” label from my rear derailleur. Maybe I’ll go out and take those stubborn decals off my front wheel. I hope those last parts get here soon, before I cross the line between progress and problematic. That is a pretty fine line between the two. I'm expert at finding the wrong side of it. If I were to have a custom frame it would be a M.A.P. or Ahearne. They actually share the same space in Portland. I'm jealous. Sometimes, having the parts trickle in lends a nice (enforced) slow tempo to a project. I find myself building so many of my projects in one afternoon, that I enjoy the occasional delay which lets me sit back and (ahem) ponder my progress.It looks quite nice, so far.BTW: I sent you an email, thanking you, and I would like to take this opportunity to do so, again! It looks great. I bet the suspense is killing you! Also, it must be hard to part with the Hilsen, you've had some great adventures on that bike. Your progress in whittling down the collection is inspiring! Sounds like you are approaching the rando thing with a fair touch of commitment? Greg, yes, I am just as committed to being a rando poseur as I was being a road race poseur.Seriously, I think a "traditional" rando bike will fit my current needs better than any prior bike I've had. And I'm hoping for more longer (for me) rides this year. Doing multiple brevets in the next 2-3 years would be icing.